(Nanowerk Spotlight) A semiconductor with a large bandgap – an energy range in a solid where no electron states can exist – cannot absorb much light to be practically useful for a solar cell, which, some 20 years ago, led to the idea of dye sensitized solar cell (DSSC) ("A low-cost, high-efficiency solar cell based on dye-sensitized colloidal TiO2 films"). Untreated titanium dioxide, for instance, absorbs light only in the UV region, but when the surface becomes modified with dye molecules, these can absorb light in the visible range and then transfer the excited electron to the titanium dioxide particle. In a standard DSSC, an organic molecule adsorbed on the surface of a porous electrode absorbs light and then initiates the charge separation process eventually leading to generation of photocurrent. While the dye appears to have "sensitized" the large bandgap material (e.g., titanium dioxide or zinc oxide), it never actually does, because only the dye molecules absorb the light and generate the carriers, the large bandgap material primarily serves the function of a conducting channel to take the electrons out. While wide bandgap materials alone can not absorb the sun light efficiently, it has been predicted that if two large bandgap materials with type-II band alignment form coaxial nanowires, the effective indirect bandgap could be substantially smaller than either of the individual materials. In a previous Nanowerk Spotlight ("'Quantum coaxial cables' for solar energy harvesting") we reported on theoretical work behind this idea. After a few years effort, one research team has now demonstrated a real functional device that exhibits the key feature of the idea: the use of two large bandgap materials to make a solar cell behaving like a small bandgap material. Sketch of a ZnO/ZnSe nanowire array prototype photovoltaic device. (Reprinted with permission from RSC Publishing). 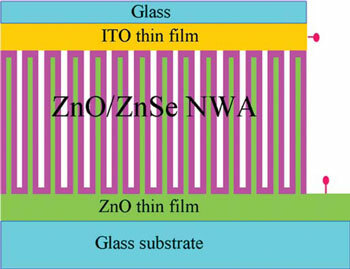 Reporting their findings in an Advance Article of Journal of Materials Chemistry ("An all-inorganic type-II heterojunction array with nearly full solar spectral response based on ZnO/ZnSe core/shell nanowires"), a team from Xiamen University in China and the University of North Carolina at Charlotte (UNCC) have fabricated a device that used two large bandgap materials (ZnO - 3.3 eV, and ZnSe - 2.7 eV). "On their own, none of these wide bandgap materials would be any practical value for photovoltaics," Yong Zhang, Bissell Distinguished Professor of Engineering at UNCC (previously with NREL when proposing the idea with his colleagues) tells Nanowerk. "When working together in the form of a core/shell nanowire, they can absorb light and show photo-response (i.e., generating a photo current) with a threshold at 1.6 eV, much below any of the bandgaps. This is perhaps the first demonstration of a real sensitized solar cell, in the sense that the large bandgap materials are actively involved in the light absorption and carrier generation processes." The underlying physics of this achievement is the type II energy alignment between the two components. In the original paper ("'Quantum Coaxial Cables' for Solar Energy Harvesting") that we reported on in our 2007 Spotlight, the scientists primarily discuss the pairing of GaN/GaP, but also briefly discussed ZnO/ZnSe, a II-VI equivalent of the III-V pair. In fact, a ZnO/ZnSe nanowire array was synthesized in 2008 by a joint team of University of New Orleans and NREL with a paper published in Advanced Materials, although not a functional device. 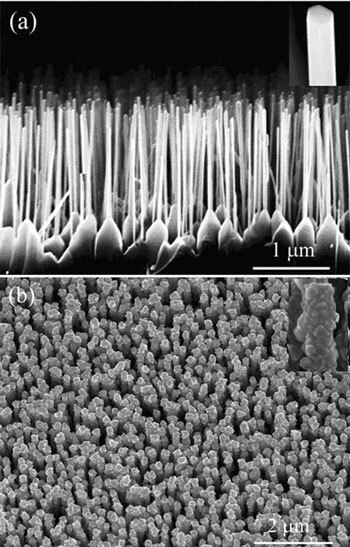 SEM images of (a) well-aligned ZnO nanowire array and (b) well-aligned ZnO/ZnSe core/shell nanowire array. The insets in (a) and (b) are high-magnification SEM images of a single ZnO and a ZnO/ZnSe core/shell nanowire, respectively. (Reprinted with permission from RSC Publishing). "A core/shell nanowire array significantly enhances the type II absorption due to the light trapping effect" explains Zhang. "Although the prototype photovoltaic device that we fabricated is far from perfect, due of the difficulty in making good contacts, it nevertheless offers reasonably good external quantum efficiency (EQE), comparable to most other nanoscale devices, and a rather good open circuit voltage 0.7 V – probably highest among all the nanowire based devices." He also points out that, even within the inorganic options, the large bandgap materials like zinc oxide and zinc selenide are known to be much more stable than the smaller bandgap materials such as cadmium telluride, which are used for thin-film solar cells. This work demonstrates the feasibility and great potential for exploring all-inorganic versions of type-II heterojunction solar cells using wide bandgap semiconductors.